Asian Art Museum of San Francisco, 9780939117390, 239pp. Filled with over 170 classical Indian works of art and expert commentary, Kingdom of the Sun is a welcome addition to the field of Indian art history. Few regions of India have so excited the imagination as has the princely state of Mewar, which has been celebrated as the most heroic and illustrious of the Rajput states. Despite this, relatively little writing has been devoted to the innovative artists whose work helped to establish the state's reputation. 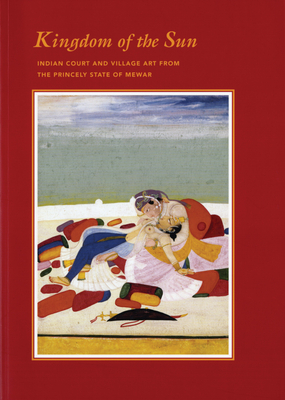 Kingdom of the Sun: Indian Court and Village Art from the Princely State of Mewar addresses that deficiency by gathering some of the finest works of Indian art. The pieces range from the early sixteenth century to the twentieth century. At the core is a selection of works that dramatically conveys the brilliance of Mewar painting. The exhibition brings to life some of the great individual Mewari painters--especially Bakhta (1760-1810) and Chokha (1799-1824)--who previously have been largely relegated to anonymity. For his book, original essays were commissioned from leading scholars--these essays represent a significant advancement in scholarship related to Mewar. Exhibition curator Joanna Williams has also written detailed entries for each of the objects on display. The result is a book that gives an intimate sense of an extraordinary place and the remarkable people who created a legacy there, one that continues to fascinate to this day. Joanna Williams holds a joint appointment as Professor of South and Southeast Asian studies and of the History of Art at the University of California, Berkley; her books include The Two-Headed Deer: Illustrations of the Ramayana in Orissa. Tushara Bindu Gude is Associate Curator of South and Southeast Asian art at the Los Angeles County Museum of Art. Cynthia Talbot, Associate Professor of History and Asian Studies at the University of Texas at Austin, is author of Precolonia India in Practice: Society, Region, and Identity in Medieval Andhra and co-author of India before Europe Tryna Lyons, an art historian who has worked with traditional Indian painters and sculptors, is the author of The Artists of Nathadwara: The Practice of Paining in Rajasthan. Kavita Singh is an Associate Professor at the School of Arts and Aesthetics, Jawaharlal Nehru University, New Delhi, where she teaches courses on Indian painting and the history of museums. Jyotindra Jain Professor and Chair of the School of Arts and Aesthetics at Jawaharlal Nehru University in New Delhi, is the former director of the Crafts Museum, New Delhi, and the author of numerous books and articles on Indian folk and traditional arts.